16 Commercial Real Estate & Properties in Arundel are listed in 4 categories. We have 11 Industrial Warehouses Sale , 2 Other Commercial PropertiesSale , 2 OfficesSale and 1 Retail ShopsSale . Immediate Liquidation - Quality Investment Or Owner Occupier Dream! Auction, Thursday 2nd May.. The Jared Johnson Lachlan Marshall Team are extremely proud to offer this investment or owner occupier opportunity. Two high quality units to be sold in one line. Strategically positioned 3 kilometres from the Gold Coast Highway 8 kilometres from both entry and exit points for the M1 Pacific Motorway. Watch the video for a virtual inspection. Our sellers are extremely motivated and have given very clear instructions to sell on or before Auction. 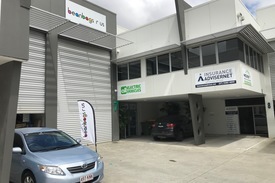 Investment information; Both units totalling 700m2 + 110m2 structural mezzanine are currently occupied by National Company Mayneline Joinery Pty Ltd $96,541.90pa + GST + Outgoings 6 Months Bond Complete make good clause Current tenant looking to entertain an extension to current lease Quality constructed concrete tilt panel building Ample car parks Great truck access Container storage / drop off Immaculately presented complex Only 4 units in the complex Lot 3 328m2 GFA + 110m2 structural mezzanine Warehouse / Mezzanine Excellent clearance throughout 1x Industrial height roller doors Exclusive amenities Kitchenette / lunch room Lot 4 330m2 GFA + 42m2 approved office mezzanine Warehouse / Office / Reception 2x Industrial height roller doors For a detailed Information Memorandum please contact the exclusive listing agents Jared Johnson Lachlan Marshall for more details by clicking on the link above. Approximately This property is being sold by auction or without a price and therefore a price guide can not be provided. The website may have filtered the property into a price bracket for website functionality purposes. Disclaimer: Ray White has not independently checked any of the information we merely pass on. We make no comment on and give no warranty as to the accuracy of the information contained in this document which does not constitute all or any part of any offer or contract by the recipient. Prospective purchasers / lessees must rely on their own enquiries and should satisfy themselves as to the truth or accuracy of all information given by their own inspections, searches, inquiries, advices or as is otherwise necessary. No duty of care is assumed by Orchid Avenue Realty trading as Ray White Surfers Paradise Commercial divisions toward the recipient with regard to the use of this information and all information given is given without responsibility. ATTENTION INVESTORS! New modern factory for sale 382m2 approx Currently leased to 06/09/2021. 3 year x 3 year option Starting rent $47,000 pa + outgoings with 3% annual increases. ATTENTION INVESTORS! New modern factory for sale 370m2 approx Currently leased to 30/05/2020. Starting rent $45,840 pa + outgoings with annual increases (the higher of 4% or CPI). The Jared Johnson Lachlan Marshall Team are pleased to present this outstanding opportunity, we have just successfully negotiated a brand new 3 x 3 x 3 year lease and the owner has instructed us to sell this asset! This will not last long, call us today! 370m2 including 273m2 Warehouse 97m2 Mezzanine Brand new 3 x 3 x 3 Year lease $47,000pa + GST + Outgoings 3% annual increases Full height industrial roller doors Exclusive amenities Immaculately presented building Rare offering in tightly held area Zoned Low Impact Easy access to Smith Street Motorway and M1 Motorway Call marketing agents today! Inspect 7 days Approximately Disclaimer: Ray White has not independently checked any of the information we merely pass on. We make no comment on and give no warranty as to the accuracy of the information contained in this document which does not constitute all or any part of any offer or contract by the recipient. Prospective purchasers / lessees must rely on their own enquiries and should satisfy themselves as to the truth or accuracy of all information given by their own inspections, searches, inquiries, advices or as is otherwise necessary. No duty of care is assumed by Orchid Avenue Realty trading as Ray White Surfers Paradise Commercial divisions toward the recipient with regard to the use of this information and all information given is given without responsibility. Brand new immaculate, high quality 600 SQM warehouse/office space in a tightly held Arundel industrial Estate.. 600 SQM total floor area 40 SQM carpeted office and air conditioned ground floor 40 SQM mezzanine storage area with forklift access Tilt panel construction with high quality finishes Dual container height roller electric shutter Ample onsite car parking and excellent truck access Secure gated estate with only 4 units in the complex Approximate If Applicable For more information please contact Sandra Carder https://youtu.be/0Dn7xeeCxGg DISCLAIMER: Subject to the provisions of the Trade Practices Act 1974 and subject to any other non excludable statutory provisions. Ellison Specialised Properties Pty Ltd for themselves and for the Vendors of this property for whom they act give notice that: (i) all information given in relation to this property whether contained in this document or given orally, is given without responsibility; (ii) intending purchasers should satisfy themselves as to the truth or accuracy of all information given by their own inspections, searches, enquiries, advices or as is otherwise necessary; (iii) no person in the employment of Ellison Specialised Properties Pty Ltd has any authority to make or give any representation or warranty whether in relation to this property. The Jared Johnson Lachlan Marshall Team are pleased to present this outstanding opportunity. The unit presents a unique opportunity to secure a functional quality investment in the heart of the Arundel Industrial Estate located just off Smith Street Motorway and M1 Motorway. 382m2 including 285m2 Warehouse 97m2 Mezzanine Full height industrial roller doors $47,673pa + GST + Outgoings 3 Year lease CPI or 4% increases whichever the greater Exclusive amenities Immaculately presented building Rare offering in tightly held area Zoned Low Impact Easy access to Smith Street Motorway and M1 Motorway Call marketing agents today! Inspect 7 days Approximately Disclaimer: Ray White has not independently checked any of the information we merely pass on. We make no comment on and give no warranty as to the accuracy of the information contained in this document which does not constitute all or any part of any offer or contract by the recipient. Prospective purchasers / lessees must rely on their own enquiries and should satisfy themselves as to the truth or accuracy of all information given by their own inspections, searches, inquiries, advices or as is otherwise necessary. No duty of care is assumed by Orchid Avenue Realty trading as Ray White Surfers Paradise Commercial divisions toward the recipient with regard to the use of this information and all information given is given without responsibility. Arundel - Warehouse With Offices + Workshop Opportunities $2,300/sqm Net Plus GST i..
382m2 total area Includes 47m2 air conditioned office with kitchenette Plus 48m2 storage mezzanine which could be converted into office Balance is ground floor warehouse Motorised roller shutter Alarm system Fast M1 access Strong return Solid tenant Great investment For SALE: $744,900 + GST Call 0402 129 455 to inspect today! Disclaimer PRO Commercial has not personally confirmed the property information we pass on. We give no guarantee as to the accuracy of this information. Prospective purchasers and lessees should rely on their own enquiries and should satisfy themselves as to the truth or accuracy of all information given by their own inspections, searches, advices or as is otherwise necessary. No duty of care is assumed by PRO Commercial toward the purchasers and lessees with regard to the use of this information and all information given is given without responsibility. 248m2 impressive front unit Comprised of 196m2 ground floor warehouse Plus 52m2 air conditioned mezzanine office Extra high internal clearance Own facilities incl. bathroom and kitchenette Motorised roller door Alarm system Allocated car parking Quick and easy truck access For SALE: $520,800 + GST if applicable With great exposure in an elite M1 adjoining location, these won’t last long. Disclaimer PRO Commercial has not personally confirmed the property information we pass on. We give no guarantee as to the accuracy of this information. Prospective purchasers and lessees should rely on their own enquiries and should satisfy themselves as to the truth or accuracy of all information given by their own inspections, searches, advices or as is otherwise necessary. No duty of care is assumed by PRO Commercial toward the purchasers and lessees with regard to the use of this information and all information given is given without responsibility. Unit 1/14 Technology Drive is the front unit in the latest development in Arundel Technology Park. This complex consists of 22 high quality and well presented strata units. The property features: 398sqm of ground floor area 86sqm of office mezzanine Street frontage Container high roller door 3 phase power Development on track for fourth quarter 2016. For further information on this opportunity contact CBRE today. 100m2 of 4 Offices + Boardroom Ducted air conditioning 100m2 of Warehouse/ with high 5m roller door 100m2 Mezzanine storage Reception/ Kitchen/ Toilets/ Parking Minutes from M1 and Brisbane Rd. Owner will sell or Lease back as a tenanted investment. SELLING AT $650,000 IN MODERN SECURE COMPLEX APPROX 146sqm OFFICE WITH 109sqm WAREHOUSE PREMISES IS VERY WELL PRESENTED WITH QUALITY FITTINGS. TENANTED INVESTMENT RETURNING 7% SOLID NATIONAL TENANT IN PLACE GOING CONCERN SO CAN SELL WITHOUT GST. SHORT DRIVE TO M1, BRISBANE RD AND GC HWY. Warehouse Space with Executive Offices Located strategically in the Arundel Industrial Precinct, only metres off Brisbane Road, this warehouse has been stylishly converted into a mix of executive offices, showroom and warehouse space. Totaling approximately 820 square metres over two levels the Unit offers: Approximately 400m2 of warehouse / Mezzanine Space 3 Executive Offices Large open plan work space area (approximately 200m2) Reception and Showroom area of approximately 150m2 Executive Boardroom 2 bathrooms (Including Disabled Bathroom) 8 Car parking spaces (3 x undercover) Minimal Body Corporate The office has been wired and networked to service 80 100 digital phone lines and has multiple work stations areas to accomodate over 20 staff members. This would be ideal for a telecommunication company, distribution company, telemarketing agency, sales office or any internet/packaging company looking for space with class and presence. Contact our office for more information.